Legacy Christian Academy senior guard Ashton Burke (24) scored the 1,000th point of his high school career on this shot, on the opening score of Wednesday’s Feb. 28 boys sectional tournament basketball game at Troy High School. Burke scored LCA’s first 13 points, finishing with a game-high 17, in the Knights’ 64-25 win over Yellow Springs. 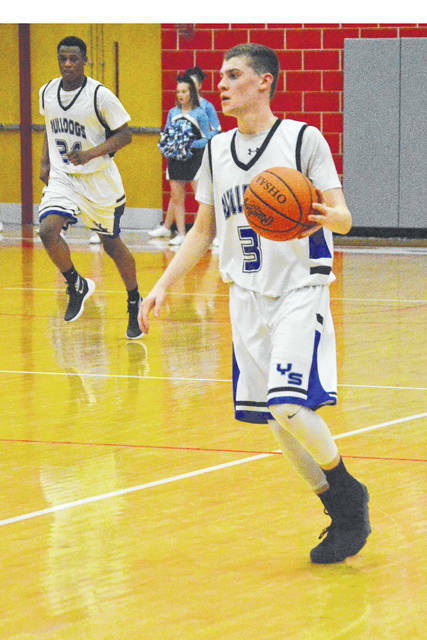 In the Feb. 28 loss, junior Andrew Clark (3) and senior James Browning (24) scored 10 points each for Yellow Springs, in the Division IV sectional tournament at Troy High School. With the Legacy Christian cheerleaders’ support, the Knights’ James Brads (21) brings the basketball upcourt against Yellow Springs senior defender Donnie Isenbarger, during the first half of Wednesday’s Division IV boys high school sectional basketball game in Troy. TROY — Legacy Christian’s Ashton Burke scored the 1,000th point of his career with the first basket of the Division IV boys high school sectional tournament game. Burke had scored his 1,011th career point before any of his teammates scored in a 13-4 opening scoring binge Feb. 28 at Troy High School. Second seeded Legacy Christian (18-6) continued to roll after Burke’s binge, and dominated Metro Buckeye Conference opponent and No. 6 seed Yellow Springs 64-25 in the sectional semifinal game. Yellow Springs (10-13) was never in this one as the Knights bested the Bulldogs for the third time this season. “We’ve had some strong starts the last few games,” Legacy Christian Head Coach Brad Newsome said. “You’ll hear football coaches talk about how their team played in all three phases of the game — offense, defense and special teams. I think we’re starting to hit our stride. We’re taking care of business on defense, our offensive execution is pretty solid, and our transition game is pretty good. I think we’re getting better in each one of those areas. The Knights hit five threes in the first quarter, as part of a 22-7 lead after eight minutes of play. LCA led 46-13 at the half, and Yellow Springs coach Bobby Crawford could be seen yelling at his beleaguered team for somberly leaving the court. 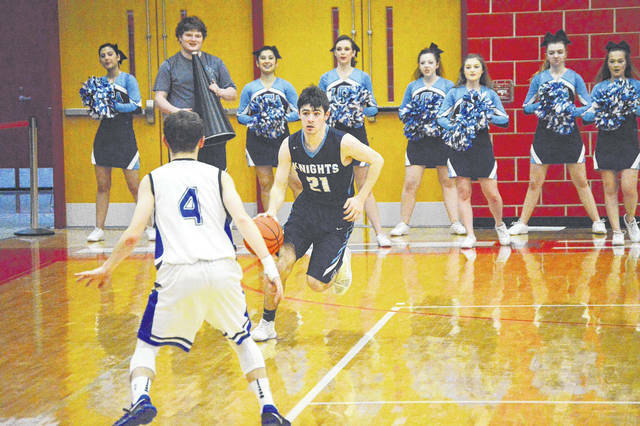 After Yellow Springs’ James Browning scored the first five points of the second half to pull the Bulldogs to within 30 points (48-18) two minutes into the second half, the Knights reeled off a 10-0 scoring run to implement the Ohio High School Athletic Association’s new Running Clock rule. When one team grabs a 35 or more point advantage, the game clock will run continuously unless the losing team pulls to within 30 points in the game. Thanks to his 13 first-half points, Burke led the Knights with a game-high 17-point effort. While there have been a few 1,000-point achievers when the school was known as Xenia Christian, Burke is the first Legacy Christian Academy player to achieve that career mark. Erik Uszynski joined Burke in double-figure scoring for Legacy Christian, finishing with 13 points. 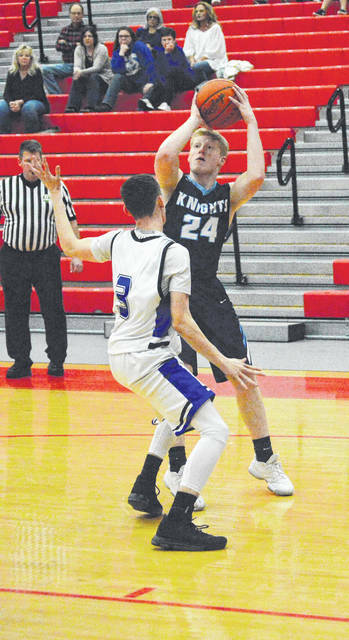 Roman Newsome knocked in seven points, Brandon Martin added six, and six other Knights teammates combined for 21 points in the win. With the loss, which snapped a two-game Bulldogs winning streak, eight Yellow Springs seniors — Elias Harris, Donnie Isenbarger, Christian Elam, Zach Bertlinger-Conn, Clay Cooper, Tony Marinelli, Browning and Fisher Lewis — played their final high school games. Browning and junior Andrew Clark both finished with 10 points to lead Yellow Springs scorers. LCA will now take on the sectional tourney’s top seed, Springfield Catholic Central, for the sectional title. That game is set for a 7 p.m. start on Saturday, March 3 also at Troy High. Is Legacy Christian peaking at the right time of the season? “I’ll let you know after Saturday’s game,” Newsome said with a wry smile.